"We no longer burn crosses but we are okay burning reputations..."
I picked up this story when it was first reported a few days after the incident occurred on March 17, 2011. I admit, I didn’t want to address it because quite honestly the claims of racism in the past decade has become a cluster of “he-said/she-said” and frankly there have been so many cases of crying wolf that I’ve become jaded. That statement does not mean that racism does not exist. On the contrary. Racism is as alive today as it was decades ago albeit in a much more subtle form. I tread lightly on the subject because it angers and upsets me enough to be mean-spirited, one of the essential ingredients of racism. Fighting malice with ignobility makes one foul and offensive. That’s not my style, especially since I’ve been subjected to racism myself by people who believe they are asking honest questions or casually repeating something that they think is accepted and sanctioned by my race. The abridged version of the story is this: Alta High School student Larz Cosby who is bi-racial, was taunted by a fellow student at a spirit rally (ironic?) who was wearing a white pillow case over his head with holes cut out for his eyes. By Larz’ account, when he entered the gym, he was pointed out by a group of instigators and the heckling, taunting and abuse took on a life of its own. Chants of “Heil Hitler” while displaying the Nazi salute ensued. The student accused of the racist acts continued his poor behavior in the class that followed the rally in which both he and Larz were attending. The parents of the accused student said in an interview yesterday (Tuesday) the event was misinterpreted and blown out of proportion and that it was a poor choice, but it wasn’t intended to be racist or invoke any KKK connections. That’s a lot like telling Dorothy, the Cowardly Lion, the Scarecrow and the Tin Man to ignore the guy behind the curtain! I don’t know what generation, State, hemisphere or universe these parents grew up in but just about anyone I know (unless you grew up in an indigenous tribe in a rain forest that does not have access to television or the Internet) understands the significance and history behind the white hood. 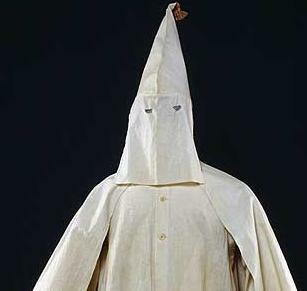 Any American, born or naturalized as a citizen knows that a white hood is an incendiary symbol in American race relations. This story and others like it is a reminder of this countries tarnished history and the implication that this student didn’t mean anything by it and that his actions were misinterpreted show the idiocy of the student and of his parents who refuse to teach their children historical context and the correct principles that should govern our social interactions. I grew up in an era when the Watts riots were still ingrained in the minds of Angelinos in inner-city Los Angeles. Racism fueled the Rodney King riots just decades later. I grew up in the sprawl of metro-Salt Lake City when there were but a few Pacific Islanders and even fewer African Americans sprinkled throughout the State. I sit by as other races call our women fat, our men wife-beaters, our people dolts and simpletons. We’re gang-bangers, illegals, coconuts and screw-ups. Nothing more, a whole lot less by American standards. The only way we can achieve is by deception. The only way we can succeed is with a helmet and pads, a rugby ball or boxing gloves. According to many, including some of my own people, the only way I have done so well in life is because of my wife. There is some truth to that because she motivates me, she supports me and she is a great advisor. But to base that statement solely on the fact that she is White is preposterous and illustrates once again that no matter how many laws, rally’s or Lifetime specials you create, racism is an intrinsic and loathsome part of the American experience. To the parents of this student and his cronies at Alta High School, use this to educate yourself and your children. Do not defend stupidity with stupidity. He was wrong, he must be held accountable. The school, its administration as well as the Canyon School District should do everything in its power to purge this from their campuses. Racism defiles and demeans the human race. It is repulsive to think that we have replaced physical lynchings with character lynchings. We no longer burn crosses but we are okay burning reputations. If you think this is overinflating a small incident, think of how underinflated the self-esteem of Larz Cosby was on March 17th and everyone like him who is targeted because he is different. I applaud Larz for taking a stand. And now you know just a fraction of why I can’t stand talking about racism.